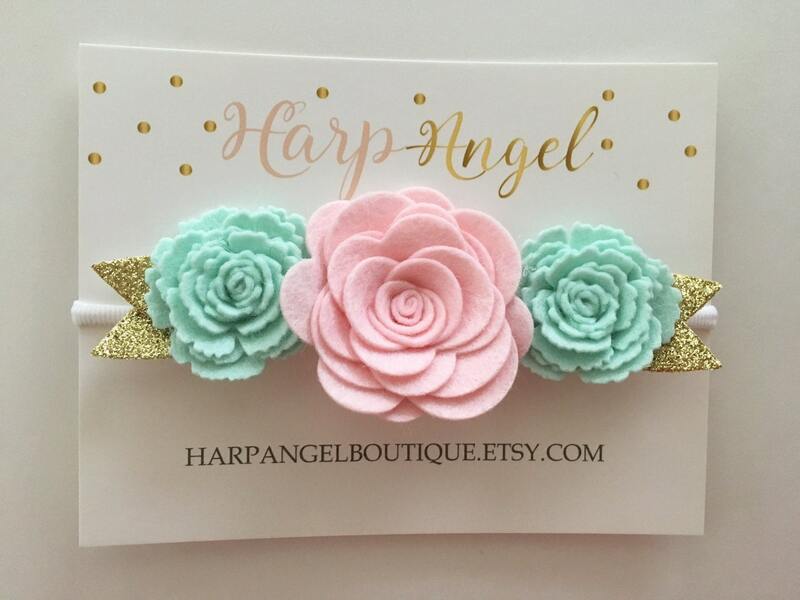 This beautiful flower crown is made with Light Pink & Mint Green 100% wool felt Rose flowers and accented with silver or gold glitter fabric leaves. It can be attached to a skinny white elastic headband, a one size fits most white nylon headband or a french barrette clip. Please specify headband size in dropdown if not using a nylon headband. For an accurate fit, please measure childs head. I can do custom sizes. **please monitor your little one while in use due to small parts. Hair accessories are ready to ship within 4-5 business days (Monday-Friday) plus shipping time. Baby bloomer shorts, skirts and hats ship within 1-2 weeks. I do not work on the weekends, so this timeline is only for Monday-Friday. If you need an item by a certain date, please put info in notes at checkout. There is also a 2-3 day priority shipping option at checkout, which is not always guaranteed. Once items are mailed, I have no control over the USPS for delayed or lost packages. I can do custom orders. Just message me your thoughts!